The year 2018 kicks off China’s efforts to put all the guiding principles from the 19th National Congress of the Communist Party of China (CPC) into action. It also marks the 40th anniversary of reform and opening-up and a major transition of China’s economy to the phase of high-quality development. In connection with this, the report on the work of the government delivered by Premier Li Keqiang in March, which gives a comprehensive analysis of China’s development, serves as a window to best see China’s development path forward. In his report, Premier Li reviewed and commented on the work of the past five years, and observed that the achievements made on every front are ground-breaking. Looking back at the past five years, with quite a number of contradictions interwoven, in particular the international financial crisis still lingering on and advocacy for reverse globalization, the growth rate of global trade lagged behind that of global economy, and the share of international trade in global GDP continued its decline after hitting a peak in 2008. The share of international trade in China’s GDP peaked at 64.8 percent in 2006. But by 2016, it dropped to 33.1 percent. It’s no doubt that China is also severely affected by the international financial crisis and the trend of reverse globalization. Chinese Premier Li Keqiang delivers a government work report at the first session of the 13th National People’s Congress on March 5, 2018. But China’s development is still encouraging for the world. 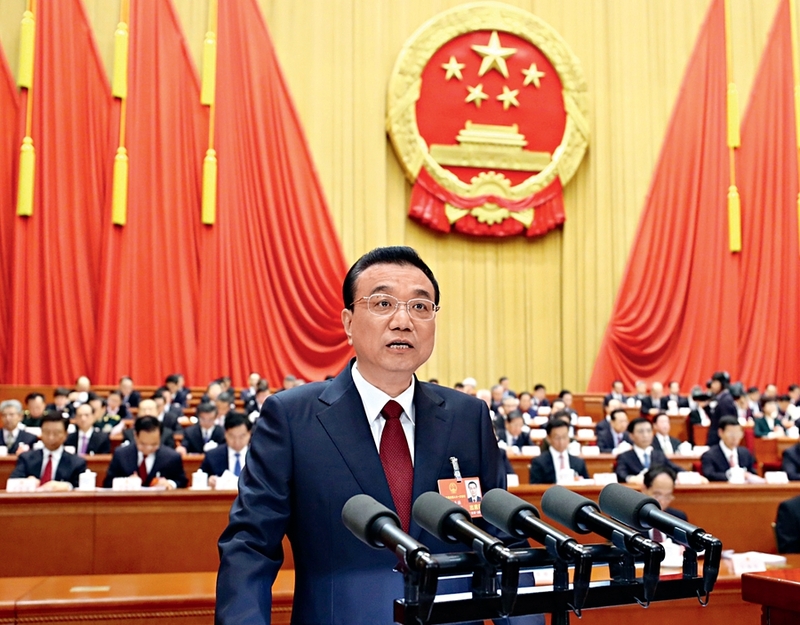 Premier Li pointed out that China’s economic strength has reached a new high. Its GDP has risen from RMB 54 trillion to RMB 82.7 trillion, registering an average annual growth of 7.1 percent; and its share in the global economy has grown to roughly 15 percent, up from 11.4 percent five years ago. China’s contribution to global growth has exceeded 30 percent. The structure of the Chinese economy has seen a major transformation. With the share of the service sector rising from 45.3 to 51.6 percent of the economy, consumption’s contribution to growth has increased from 54.9 to 58.8 percent, becoming the main driver of growth. Innovation-driven development has yielded fruitful outcomes. China’s investment in research and development (R&D) has grown at an average annual rate of 11 percent, ranking second in the world in scale. The contribution of technological advances to economic growth has risen from 52.2 to 57.5 percent. In manned spacecraft, deep-water exploration, quantum communications, large aircraft development, and more, China has seen a stream of major outcomes of innovation. Significant headway has been made in reform and opening-up. Reforms to streamline administration and delegate powers, improve regulation, and optimize services have driven profound shifts in the function of government, and significantly strengthened market dynamism and public creativity. The Belt and Road Initiative has been making major progress. The composition of both Chinese foreign trade and foreign investment has been improved, with volumes ranking among the largest in the world. Living standards have been constantly improving. China has made decisive progress in the fight against poverty: More than 68 million people have been lifted out of poverty, including a total of 8.3 million relocated from inhospitable areas, and the poverty headcount ratio has dropped from 10.2 to 3.1 percent. Personal income has increased by an annual average of 7.4 percent, outpacing economic growth and creating the world’s largest middle-income group. The environment has seen gradual improvement. To address air, water, and soil pollution, China has designed and enforced a 10-point list of measures for each and achieved solid progress. It’s fair to say that the achievements China has made in the last five years have covered every front and are ground-breaking, signifying rapid development in the economic, political, cultural, social, ecological and national defense spheres. The past five years have also seen unprecedented improvements in China’s international influence and image. Distinctively Chinese major country diplomacy has been pursued on all fronts. The country successfully hosted the first Belt and Road Forum for International Cooperation, the 22nd APEC Economic Leaders Meeting, the G20 Hangzhou Summit, the BRICS Xiamen Summit, and other major diplomatic events at home. China has called for building a community with a shared future for mankind and has contributed more Chinese ideas to the reform of the global governance system. The RMB was included in the IMF’s Special Drawing Rights basket, representing a major step forward in its internationalization. China’s economic, scientific and technological, national defense and overall strengths have all become front-runners in the world, contributing to an unprecedented advancement in China’s position in the world and bringing about huge opportunities to the world.